Here’s my review of the new Star Trek movie: It was awesome. Just pure, unadulterated awesome sucked up into a syringe and injected right between your toes. I’m assigning J.J. Abrams as the beneficiary of my 401k in the event that my little heart gives out when I go to see it again, like tomorrow. It was great, is what I’m saying. The cast was, once more, as tight and on-character as a tachyon beam. Despite the fact there was nearly non-stop action, (and the 3D was the best I’ve seen since Avengers, btw, definitely worth the extra few bucks) character development and their relationships and banter was constantly at the forefront. In fact, like all of the best Trek, this was a character driven movie, even more so than this crew’s first outing four years ago. It improved on its predecessor in every way. I’ve got to admit, between the action, the nods to Trek history, and the brilliant character writing, I was way overstimulated. The entire movie, every second of it, I was sitting there in a little puddle of nerd goo, smiling and giggling like someone in desperate need of a psych eval and a padded cell. It was Trek in all its grandeur, silliness, and its emotional core of brotherhood and hope. It kills me that so many people who count themselves as Trek fans have turned on it. 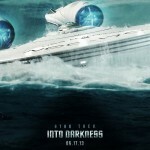 Over and over, I hear that it’s a summer action movie, but it’s not really Trek. Somehow, they’ve gotten lost among the foam of complaints about pacing, Apple-Store set design, and lens-flare. They Pine for the Trek of their youth (Get it? Chris Pine plays… oh forget it.) and focus entirely on the superficial differences instead of recognizing the core DNA they share. These guys are missing out. My love of Trek goes way, way back twenty-five years ago. I was eight years old, and I’d stayed home from school sick. I was tripping balls on NyQuil, but my little ADHD brain wouldn’t go to sleep, so I sneaked out to the living room to watch TV after my dad fell asleep on the couch. Back then, Channel 3 out of Madison played TOS reruns at midnight. My first episode of Star Trek was “Spock’s Brain”, viewed on a 12′ black and white TV. Arguably one of the worst episodes of the entire series, except maybe the space hippie ep, but to a budding eight-year-old nerd, it was pure magic. I sneaked out the next three nights and watched “Space Seed”, “The City at the Edge of Forever”, and whatever the Nazi planet one was called. My dad admitted years later that I wasn’t nearly as sneaky as I thought, and he’d sat there silently watching his son “getting away with” watching one of his favorite shows, too. Many of you will think about the timeline of this and realize what happened next. It was 1988, and Next Generation was just getting going. It wasn’t long before I realized this and got absolutely hooked as new episodes came out each week. Here’s the thing, guys, Trek has been constantly reinventing itself for decades. Next Gen is a very different show from TOS, DS9 is even more different from Next Gen, and so on. Now, I understand this is the first time we’ve experienced the recasting of characters, but so what? A good friend of mine explained it to me like this over the weekend. What Trek has accomplished is to transcend TV and film. Kirk, Spock, Bones, Scotty, Uhura, Chekov, and Sulu are something else now. They have become American archetypes. They are one of our contributions to world culture. And just as Hamlet has been played by a thousand actors, James Bond gets a new face every few years, and we’re on our eleventh Doctor Who, (the best one, incidentally) we’re going to have to deal with the fact Kirk, Spock, and McCoy will be reintroduced to each new generation in many, many different forms. The fact our favorite characters have moved past the actors who launched them is a sign of their strength. Each has their strengths, each has their weaknesses, and each would be nearly useless without the others to balance them out. Just like real life. We all know a Kirk, we all know a Spock, we all know a Bones. It’s why Gene’s characters continue to resonate today, and will for an unknowable amount of time into the future. They touch on something fundamental about being human, struggling against one’s demons and trying to impose some measure of fairness, justice, and honor on a chaotic, uncaring universe. And always leaning on your friends and family, building on each other’s strengths and guarding each other’s weak spots. These last two movies have done that beyond my expectations. And they were pretty high. The Trek that has been was simply awesome. People remember it fondly for good reason. But times change, progress marches on, and the stories we tell have to adapt to survive. This is what Trek is today, and it’s equally awesome. 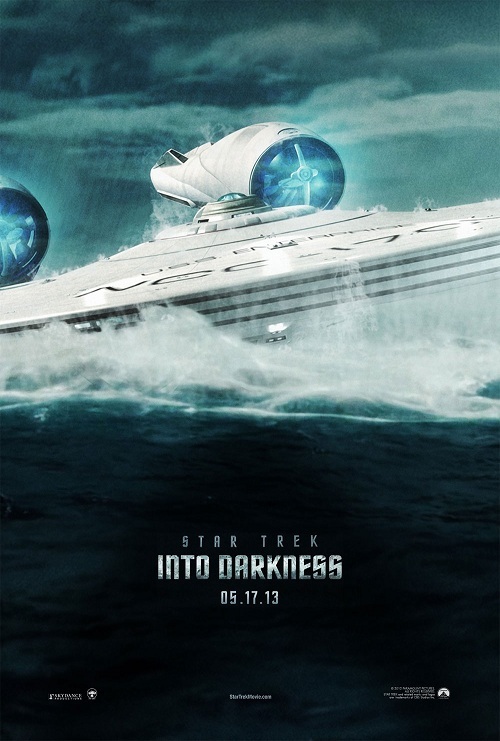 Go see Into Darkness, right now, ignore the big plot hole at the end, and let your geek flag fly high. Afternoon all! A few things to cover in today’s update. First of all, I was fortunate enough to be last week’s guest on Dungeon Crawlers Radio. If you missed it, you can find a recording here. I come in around the fifteen minute mark, and if you keep listening, you get a bonus interview with actor Ted Raimi! Next up, I’m going to be appearing at Origins in Ohio next month. Lots of cool stuff going on there. I’ll be sitting on several panels along with a whole bevy of my talented author-type friends, some of us are sure to do a reading party of Sidekicks, and perhaps most excitingly, Eighth Day Genesis has been nominated for an Origins award! All of the authors involved in the Library, (as we’re calling the writing track programing) have collaborated to write an anthology, which will be available for sale both at the show and online, and includes such genre luminaries as Michael A. Stackpole ans Timothy Zahn. My short, “A Blank Canvas” is somewhere in the middle. If you can’t come out to Ohio, please consider supporting the authors by picking up a copy. And finally, I have a new antho out! “A Walk in the Abyss” features stories set in Shane Moore’s “Abyss Walker” universe. With tales Shane, Patrick M Tracey, Paul Genese, and my short “Unerring”, it’s sure to be a crowd favorite. Paul also edited this one, and brought the same sharp eye that he’s used editing the Crimson Pact series. As an added bonus, you get the first five chapters of my novella “A Wererat’s Tale: The Collar of Perdition! Come check it out!